THERESA MAY, Prime Minister of the United Kingdom, said today’s meeting was taking place while the world faced challenges “that test who we are”. Many of those — such as the terrorist threat that had struck her country five times this year — did not recognize international boundaries. Climate change was degrading and depleting the planet, and millions were fleeing their homes in search of a better life. There were massive inequalities around the world and weaknesses in the global trading system, both of which were pushing some countries towards protectionism. As the global system struggled to adapt, some countries were deliberately flouting international rules, she said, citing the unforgivable use of chemical weapons by the Syrian regime, and the proliferation and threat of nuclear weapons use by the Democratic People’s Republic of Korea. Calling on countries to defend the international order and the values of fairness, justice and human rights underpinning the multilateral system — including through agreements such as the Paris Accord and the Nuclear Non-Proliferation Treaty — she said the international system with the United Nations at its heart was the “amplifying force” for those values. Indeed, “we have to strive harder” to defend and reform the United Nations, she said, and those who flouted the rules and spirit of the Organization must be held to account. 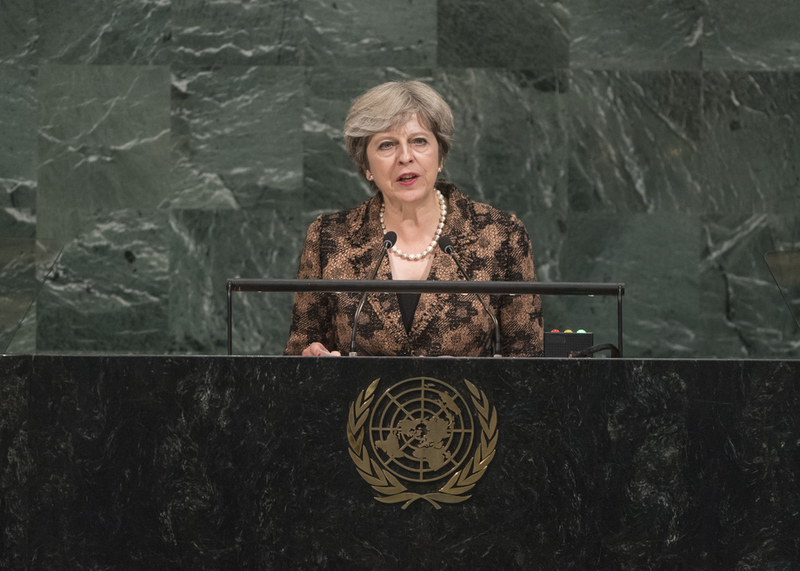 Noting that the United Kingdom had long supported the United Nations, she nevertheless said the Organization suffered from a gap between its purposes and their delivery. Member States must embark on the Secretary‑General’s reform agenda, she said, calling for better cooperation, improved gender equality and reduced competition on the ground. As an outward-looking, “global Britain” — and the world’s second largest donor — the United Kingdom would continue to support the Organization. However, it would now set aside 30 per cent of its funding, to be paid only to those parts of the United Nations that achieved required results. In the year ahead, the Organization must ensure that global agreements were applied in practice, she said. On migration, the proposed Global Compact must provide for safe, orderly, well-managed and legal migration, or risk pushing people into modern-day slavery. Stakeholders must work harder to address the drivers of that phenomenon, she said, noting that the same was true of terrorism. When such attacks struck London and Manchester this year, the United Kingdom had carried on. “The terrorists did not win, for we will never let anyone destroy our way of life,” she stressed. But, defiance alone was not enough. Noting that, for the first time, Governments and industry had come together to “reclaim the Internet from those who would do us harm”, she said the ideologies underpinning terrorism must also be addressed. In that regard, she asked the Secretary-General to make the fight against terrorism a core part of his agenda by proclaiming it the theme of next year’s General Assembly session. Meanwhile, States must strike a balance between protecting their people and protecting their freedom. In northern “Burma”, she called on authorities to end the violence there and implement the recommendations of the advisory commission headed by former Secretary-General Kofi Annan. States bore critical responsibilities that the United Nations could not take on alone. Instability and conflict were often driven by States acting through proxies, she said, citing the examples of countries supporting Hizbullah and “so-called separatists” in Ukraine, or providing tacit support to criminal groups that launched cyberattacks. The United Kingdom would remain steadfast to ensure the safety and security of its allies, she said. Turning to Syria, she said that, while all nations must stand together in the face of confirmed cases of chemical weapons use, the United Kingdom took seriously its responsibility as a permanent Security Council member. Recalling that it had not used its veto in a generation, she said one other permanent member had repeatedly employed it to prevent action against a despicable regime. Today, a more immediate global danger had emerged in the actions of the Democratic People’s Republic of Korea, whose contempt for its neighbours and the rules of international peace and security were clear. Pyongyang had continued its violations despite the Council’s unity on the matter and adoption last week of a resolution creating the largest sanctions package in history. Indeed, it would continue to do so unless Council members were prepared to take all necessary measures to tackle that threat. She called on all States to exert pressure on the Democratic People’s Republic of Korea and to demonstrate that their resolve to uphold international law was stronger than Pyongyang’s resolve to violate it.